What does Full Palette mean? Putting titles on paintings is a way to keep track of what’s what. I’ve tried titles like Landscape #1 or Vista #47 only to quickly realize that it muddles things up and creates chaos. My titles invariably describe the piece in a word or two. The title, Full Palette, came about because this oil painting contains the six colors (plus white and black) of the color wheel: yellow, orange, red, purple, blue and green. Obviously there is a myriad of mixtures, tones, and hues used to arrive at a cohesive whole. This particular view drew me in because there was a mystery created in the dark waters of the foreground and the shaded barrow from whence the water flowed. I wanted to explore the river upstream but it was unreachable at that time. So I decided to paint it. I knew upstream was dark hued oil paint in a wash layer, several direct layers and probably a glaze. I covered the whole palette with having yellow leaves, orange leaves, red (pink) fallen leaves, purple water, blue sky and green vegetation. Paint handling on Full Palette proved to be a challenge because of the sharp light contrast as well as a competing edges. 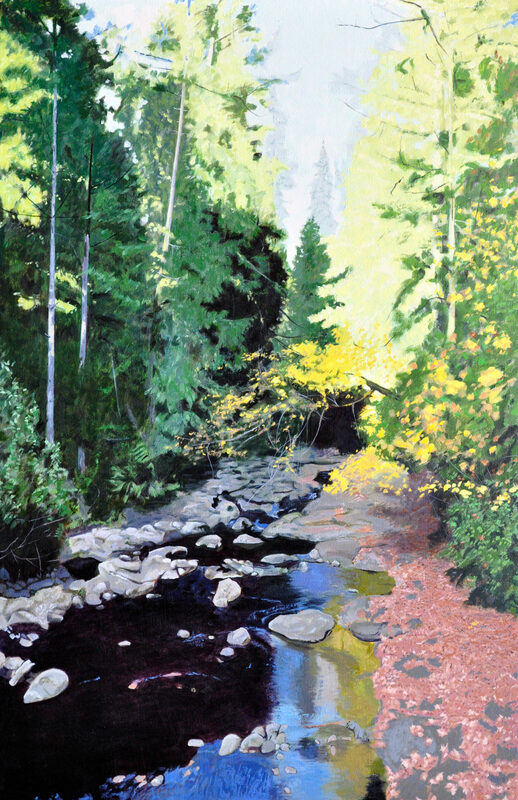 The upper part of the painting is in the sunlight while the lower half is in reflected light. The sharp edges of the rocks needed to work with the soft edges of the various types of vegetation.